How can the Catholic laity fulfill their "universal call to holiness" when this is what they are nourished by? This November will mark the 40th year since we were given the Novus Ordo Missae by Pope Paul VI. The promulgation of the Novus Ordo (NO) was just one part of a larger program of ecclesiastical reform, beginning with the pontificate of John XXIII, that was aimed at "opening" the Church up to the modern world and "sanctifying the laity." While we have had an immense amount of excellently done research and critique on the damages that have resulted from the attempt to "open the Church" to the world, I'd like to look at the concept of the "sanctification of the laity." Sharing a common dignity as members from their regeneration in Christ, having the same filial grace and same vocation to perfection, [the laity] possess in common one salvation, one hope and one undivided charity...all are called to sanctity and have received an equal privilege of faith through the justice of God (LG 32). As an aside, I don't know where liberals come up with this notion that "before Vatican II, the Catholics thought that only priests and religious had to be holy." It's as if these people never knew about the great moral theologians who wrote for the laity, men like St. Alphonsus, St. Francis de Sales and Venerable Louis of Granada. There certainly was an emphasis on the "universal call to holiness" prior to Vatican II, and I'm unsure where people get the idea that there wasn't. But this brings me to my point: Vatican II attempted to make the grace that flows through the Church more widely available to the members of the Church by drawing a special emphasis to the role of the laity in God's salvific plan. By encouraging the laity to more actively evangelize and participate in the Christian life (both good things objectively, depending on how we define "evangelize" and "participate"), the idea was that we would wind up with a holier laity. In fact, this is the opposite of what actually happened. Like many other ideas from this turbulent period, the "universal call to holiness" was turned on its head. Whereas the original idea was to call all the laity to rise to a new level of sanctification and perfection, what the "call to holiness" actually became was a sanctification of the urbane and secular as just as good as the traditional means of attaining holiness. Prior to Vatican II, the word vocation was unambiguous (at least in the Church). It meant a call to serve God in the consecrated life. Now, thanks to a widening of the term we have a definition of vocation that can mean anything. I remember asking one of my Youth Group kids once if he thought he had a vocation. He said, "Oh, absolutely." I said, "Really! That's wonderful. Are you considering the diocesan priesthood or a religious order?" He looked at me puzzled and said, "No. law enforcement." He understood "vocation"to simply mean whatever you do with your life. Of course, I'm not denying that God calls different people to different things, and "calling" is what vocation means, but I think you see my point. Instead of being taught to prayerfully consider sacrificing everything to the service of God, people are being given the impression that whatever they happen to be already doing is what sanctification is all about. So if you are a garbage man that suddenly becomes your "apostolate" or being a lawyer is your "vocation," and you think that you become holy by just being a good garbage man or a swell lawyer. 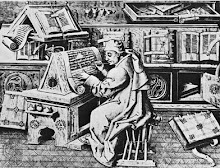 Of course, we are called to use the circumstances in our daily lives as means to holiness, but nobody in the past ever referred to secular work as an apostolate or a vocation. Here's the irony - while the emphasis on the universal call to holiness is teaching the Catholic layman how to use his daily routine as a means to attaining sanctity, the fact is that now, after forty years of this being preached, the average Catholic is less inclined to understand or practice offering up his daily sufferings for his own salvation than the supposedly ignorant pre-Vatican II Catholic was. Every Catholic in the old days knew about "offering it up" whenever they faced a daily sacrifice. How many Catholic parishes now teach their people to offer up their trials in union with the suffering of Christ for the salvation of souls, both their own and others? This is the tried and true way that lay Catholics have always attained holiness. And since lay holiness has become an object of emphasis, we have lost this devotional practice and the lay people are neither holy nor cognizant of what holiness even means. Wasn't the "universal call to holiness" supposed to sanctify the laity? It seems like it just made them more apathetic. There is a noticeable lack of holiness in the post-Conciliar Church, and to bring this back to the title of this post, I refer you to the lack of Novus Ordo saints. Think of some of the great modern saints and blesseds. St. Maximilian Kolbe. St. Padre Pio. St. Edith Stein. St. Faustina. Ven. Solanus Casey. St. Jose-Maria Escriva. St. Gianna. Blessed Mother Teresa (whom I have grave reservations about). Let's even throw John Paul II in there for spits and giggles. What do they all have in common? They all either lived all or most of their lives, or at least their formative years, in the pre-Conciliar period and had their spirituality formed and nourished by the old Mass. 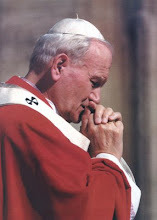 Even John Paul II, in his youth and adulthood, grew into his Catholic and priestly identity in the old rite. Not only were they formed in the old Mass, but they positively preferred it to the NO. 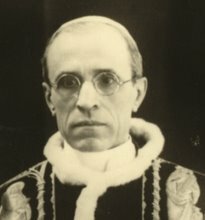 St. Jose-Maria Escriva, while obeying the Vatican in implementing the NO, struggled with it and was eventually given permission to continue to say the old Mass. Padre Pio died a year before the NO was introduced, but when he heard that some in the Church were tinkering with the traditional Mass, he sadly said in holy ignorance, "Why would anybody do such a thing?" Now, I ask you this, where are all the saints who have been formed and nourished primarily in the Novus Ordo period? There aren't any. All of the recent canonizations have been men and women that the popes have had to reach back into the pre-Conciliar era to find. But here are all the holy men and women that have been enriched and sanctified since the introduction of the new Mass? Where are the benefactors of the universal call to holiness? They are so blatantly absent that the Church has tended as of late to regard any form of penance as heroic. I once heard a story from England, I believe, in which a cab driver was killed in a car accident. They removed his clothes and found that he had been wearing some kind of hair shirt. Without knowing anything else about him, the local bishop wanted to open a cause for him, apparently on the presumption that anybody who was actually practicing mortification must be holy. Perhaps part of this problem is due to the fact that it takes a long time to canonize saints, and we have only had the NO for forty years. I grant this as a possibility, but remember, it only took four years to get St. Francis canonized. St. Dominic was canonized thirteen years after his death, and St. Alphonsus was beatified twenty-nine years after his death. It only took twenty-six years for St. Charles Borromeo. Though there are standard waiting periods between death and canonization, these examples prove that if there is eminent holiness that is obvious, it is not difficult to get the canonical wheels rolling and get a saint proclaimed to be so. The fact is, the post-Conciliat Church lacks examples of eminent holiness. This is in part why there is such a rush to canonize John Paul II. 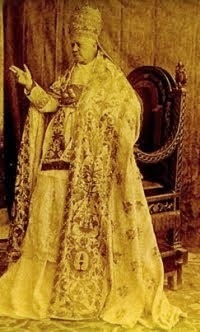 In JPII, the progressive segment of the Church will finally get it's Novus Ordo saint. But even if JPII were canonized, I wouldn't call him a NO saint, since, as I said, he spent his formative years being nourished by the old Mass. It will be interesting in ten or twenty years to see how many saints come rolling out who were formed in the years between 1962 - 1985. I'm guessing not too many. Usually, even if someone is not beatified yet, you hear about them. Everybody in Michigan knows about Venerable Solanus Casey. He died in 1957, and might not be beatified for some years. 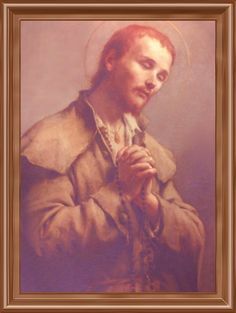 But, because of his saintliness, he is already well known and has been venerated since the day of his death by the Catholics of Detroit. But where are all the venerables and blesseds who have lived and died primarily in the Novus Ordo period? Forty years is a long time - there must at least be some! I don't want to take away credit from the families who truly are pursuing holiness and sanctity in this age. God bless them, and may we get more such families! But the kicker is that the families that are purusing holiness are doing it largely by a spiritual life centered on traditional practices and devotions and rejecting modern notions about "active participation" and all that garbage. 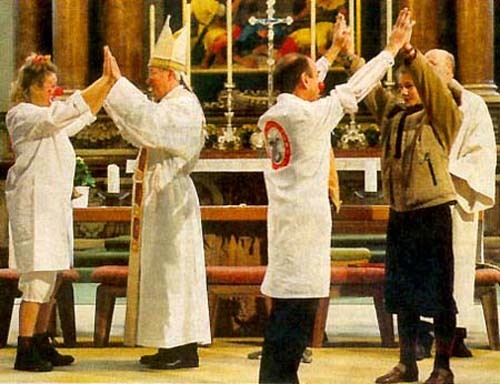 So where are the Novus Ordo Saints? I definitely wouldn't look for them among the post-Conciliar religious orders. Nor, do I think, could we hold up many bishops as candidates, perhaps with the exception of Fulton Sheen - but even there I think there may be a tendency to confuse holiness with profundity and sanctity with popularity. I don't know of any priests who would qualify; Fr. John Hardon (1914-2000) spent the majority of his priesthood, thirty-one years, celebrating the NO, but he is not even a venerable yet. And even if he were canonized, again, he spent the first forty-five years of his life in the old rite. But show me a blessed or even a venerable who was born after 1945. Despite the call to holiness, the Church has failed to give the laity the tools they need to nourish and fulfill that call, leaving a laity that neither knows what holiness is, nor values it, nor consequently seeks it. 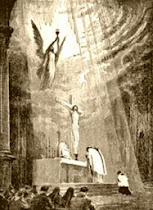 This is behind the modern tendency to view any virtue, any penance or any popular cult-following as a sign of holiness. The holiness that does exist in the Church exists to the degree that individuals follow the beaten path laid down by the saints and fathers and reject the modernist silliness that has become Catholic worship and spirituality. To be fair, the documents of Vatican II use the term "vocation" in a wider sense than simply "calling to the consecrated life," particularly in Lumen Gentium. I know. That's my whole criticism. They shouldn't use the terms so widely - it should be more restricted to mean primarily a calling to the consecrated life. When we start to talk about everything we do as a vocation, it makes people think that whatever they are doing is just as good as what the saints have done - that marriage is equal to virginity, that the active life is just as good as the contemplative, etc. The word vocation should once again have the restrictive meaning. 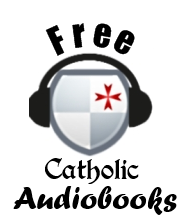 If you have not already read it, you may enjoy Raymond Arroyo's "Mother Angelica: The Remarkable Story of a Nun, Her Nerve, and a Network of Miracles"
We may find that the NO saints are those who kept the church from collapsing under the "Spirit of Vatican II". I would suggest Dorothy Stang (1934 - 2005, I believe) as the model of sainthood for the progressive wing of the Church. Very works-oriented. Concerned with rights, the environment, oppressed people. Tragic death. Very little to do with liturgy, traditional or otherwise. It seems to me that NO allows people to answer the call to holiness only half-heartedly. They can participate in the religious life and sacraments without making the commitment of a consecrated life. The NO version is the easy way out. It's difficult to say if there are any NO saints. Saints often do not live spectacular (public) lives; e.g. St. Faustina or St. Theresa Benedicta. We shouldn't therefore conclude that they don't exist. It should (contrary to the practice of the late saint factory) take a very long time to beatify and canonise someone, so this article should be written in 50 or 100 years, when we can truly assess the situation. I think Bl. Mother Theresa was certainly "saintly" in regards to her work, but I don't think she should be officially declared a saint. You've read some of her strangely indifferentist statements. Hmm, Mother Angelica was formed in the old rite and really was nurtured by tradition. Me may find that there is a possibility of some Saints who kept the Church collapsing under the "Spirit of Vatican II) yet I would posit that all of them come from a Traditional mindset, which existed before Vatican II. One other thing I thought of...the fact that confession lines were so much longer in the past suggests that people in the past were that much mroe aware of the need for personal holiness...now, we have a much more explicitly stated call to holiness but a lack of confession, which suggests a disconnect between what it preached and what the laity actually do. But it appears he preferred the NO? There was a story once that he said “we have no use for that anymore” referring to the TLM. And anyway, if one is canonized doesn’t that mean they are simply in heaven? Does the infallibly of the canonization spill over to the area of “yes, this person is worthy of imitation” as well? If not, then I guess you could see NO saints if someone tried really hard to get them canonized since canonization would only mean they’re in heaven. 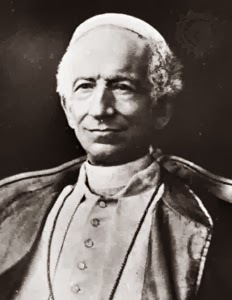 It is the Traditionalists who keep it from collapsing – though they may be ones forced to offer the NO while doing all possible to help the Church. “But then that would be a NO saint.” No I believe the context is of both being formed in the NO and preferring it. That's just great because if they canonize JPII it will be very troublesome for my spiritual life. “- The local Council at Gangra in Asia Minor, in 362 AD, excommunicated anyone telling a slave to despise his master or withdraw from his service. The same decree is repeated in a Council under Pope Martin I in 650 AD! “- The ninth Council of Toledo in 655 AD imposed slavery on the children of priests. “- The Synod of Melfi under Pope Urban II in 1089 imposed slavery on the wives of priests.” etc. etc. Canonization,Declaration by the Pope that a deseased person is raised to the full honors of the alter,i.e. a saint after previously having been beatified. 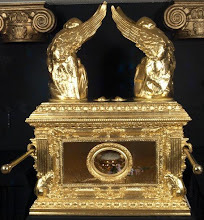 Two miracles credited to beatus are usually required before canonization to attest the heroic virtue of the saint.Beatification allows veneration of the blessed, canonization requires it.